Lindsay Liu, her partner Dan, and their dogs Dweezil, left, and Mia. There are plenty of pet owners who go out of their way to make life nice for their animal friends. But buying a whole new apartment solely to accommodate the needs of your aging dogs is pretty next level. 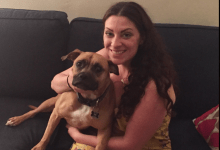 That's what digital marketing professional Lindsay Liu and her partner Dan Dalzotto, founder of the contract-writing startup Outlaw, did when the stairs in their Williamsburg duplex became difficult for their dogs to navigate. 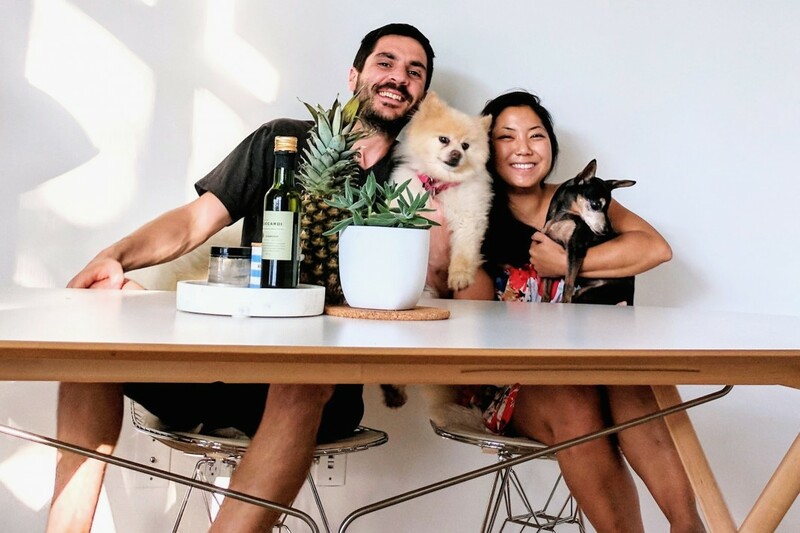 We talked to Liu about how they decided they had to move, and what it's like to base an apartment search as much on your pets' needs as your own. Here's her story, in her words. Before Dan and I moved to Bed-Stuy late last year, we lived in our place in Williamsburg for over two years. When we moved there, the criteria for an apartment was that it had to have space for my dogs and cat—and I foster dogs, too—to run around. We loved our building. It couldn’t have been more dog-friendly as you can see in this video our broker made for us. We loved the fact that it was a close-knit, 20-unit building. I had keys to my neighbor’s apartment. We all took care of each other’s pets. We loved chatting out front—with our pets by our sides, of course. I knew that was a pretty unique set-up. But we knew we had to find another place to live because our oldest dog, Mia, who is turning 17 soon, was having lots of trouble walking due to her arthritis. And Dweezil, our 15 year old, has gone deaf. And, even though our place was on the ground floor, there’s a half staircase up to the living/dining area and a half staircase down into the bedroom. The dogs usually slept during the day upstairs and then on our bed downstairs at night, and it was nearly impossible for Mia to climb those stairs. 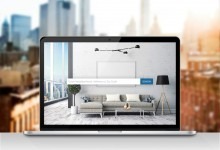 One of the first things we did as the possibility started to become more of a reality was reach out to a few banks about whether we would be likely to get approved for another mortgage, and if so how much we could get approved for. Knowing this gave us a good sense for what our parameters for the search were. 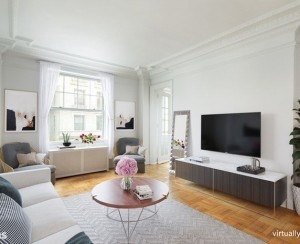 To help offset some of the costs of the other mortgage, we are currently renting the apartment to a close friend of ours who has moved to New York and is looking after the apartment for us. 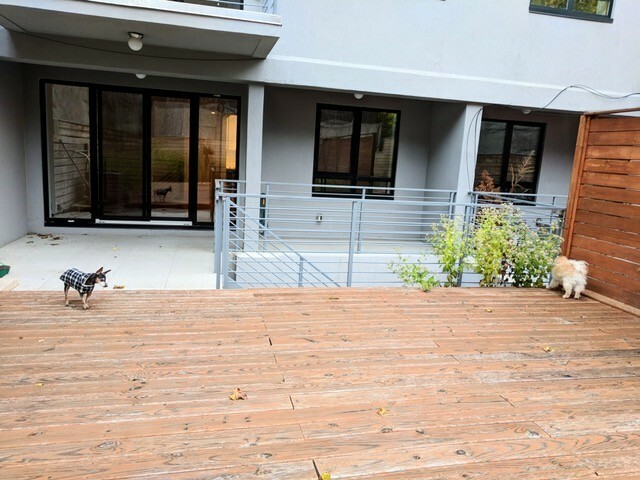 The number one thing we needed in our new place was a backyard, not a terrace or balcony, where our dogs would feel safe and could walk around on their own. We also knew we had to limit the number of stairs in whatever apartment we would move to next. When we began our search, we started really wide. We were a little less tied to a location and were excited to try a new neighborhood, so we searched almost everywhere in Brooklyn and Queens. We made two offers that we didn’t get. The first one was in Bushwick. The owners had put a lot of love into the place. They had refinished the floors and it had a great aesthetic. 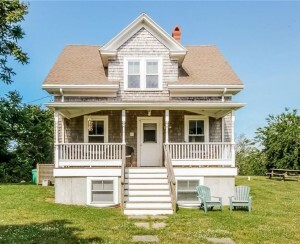 Unfortunately, they took it off the market, and [funnily enough] friends are now renting it! The second one was across from the park in Fort Greene. It had a backyard, which was exactly what we were looking for and, even though the place didn't have an ideal layout, we put in an offer. We found out soon enough that our offer was right in the middle of 12 other offers, so we didn’t get it. I’m a little intense, so that made me nervous, especially since we were going to 6-8 open houses every weekend and not seeing anything that would work for us. The dogs inspect the back deck in Bed-Stuy after their owners made an offer. But persistence comes in handy. When we found the condo we eventually closed on in November, we liked that it’s in an eight-unit building. 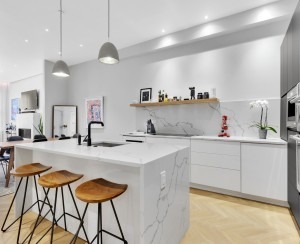 We wanted to find that community feeling, like we had in Williamsburg, and we also liked that the unit had a similar layout as well as a beautiful, 1,000-square-foot backyard. And, while we weren’t sold on the original layout, we ended up bringing in our contractor to make it work for us. We were lucky that we had our Williamsburg place to live in while they redid the floors and moved walls for us and could move in in December. The dogs are happy, too, especially because we found this sensor-enabled slider that lets the dogs go in and out of the door to hang out in the backyard whenever they want to. I’ve been watching them from my doggy cam! While we loved the other [residents] in our Williamsburg building so much, this building has a similar community feel. For example, the first week after we closed, the building had a board meeting and we got to meet everyone[...] It’s a self-managed building, so everyone is on the board. The cool thing about that is that it really feels like it’s everyone’s building. No one feels like they can get away with not participating in it. You have full visibility of what happening. We’re all pitching in. 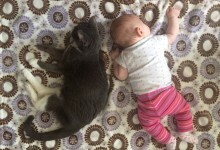 Best of all, I don't have to worry about Mia and Dweezil as much anymore.